Combine first 5 ingredients in a medium bowl. Divide chicken mixture evenly over 4 tortillas. Sprinkle quesadillas evenly with cheese. Top with remaining 4 tortillas. Heat a large skillet over medium-high heat. Coat pan with cooking spray. Add 1 quesadilla to pan; cook 1 minute on each side or until golden. 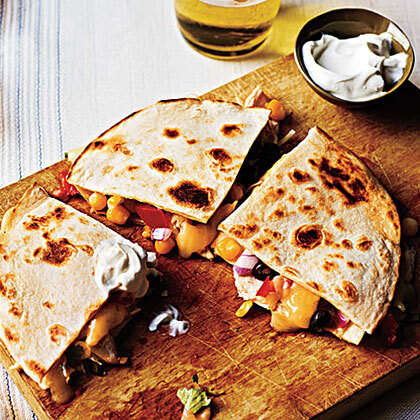 Remove from pan, and repeat with remaining quesadillas. Serve with sour cream.